David Clark at his home with his dogs Butch and Bruno. In tragic circumstances, David Clark saw first-hand just how important the work of the inspiring Friends of Anchor team at Aberdeen Royal Infirmary is. His wife Ruth had begun suffering the symptoms of oesophageal cancer while they were on their honeymoon in Tenerife. It was something he was unfortunately all too familiar with, having gone through treatment for cancer in the years beforehand. And while he knew about the pains and side effects which come with it, he said his wife refused to complain and remained “amazing” in spite of what she was going through. She died a short time later and now, two years on, Mr Clark will take to the stage to raise money for the charity which helped her in her time of need. Alongside 23 other men, who have all faced or are facing a cancer or haematology diagnosis, the 53-year-old will participate in Brave – a fashion show at Aberdeen Beach Ballroom in aid of Friends of Anchor. Mr Clark was told he had cancer in December 2011. “I needed a double hernia operation, so I went through that and then I got the shingles,” he said. “After that a massive lump came up on my neck and I was back and forth to the hospital. The factory worker can still remember the dread he felt as he prepared to break the news to his family, as his uncle had died from the same type of cancer the year before. After his treatment, Mr Clark handed in his notice at Aberdeen firm Styropack. It was there he had met his wife-to-be and while they were keeping their relationship quiet, it was taking its toll. He said: “We had been keeping our romance a secret for ages until one of the bosses found out – and then the cat was out of the bag. “We worked in the same department so couldn’t get the same holidays off. Mr Clark soon found another job, this time in the energy industry, and said things were “on the up” for the two of them until Mrs Clark’s death. And then his mother, who Mr Clark described as “his rock” following the tragedy, died from cancer last year. However, he says the experience has spurred him on to give something back to those in need. He said: “When Ruth was in ARI, that’s when I first came across Friends of Anchor. “One of the girls in the ward was called Erica and she was just brilliant. “She helped my wife with everything and she’d bring cups of tea and biscuits for me as well. It was at this stage Mr Clark became aware of Brave, the charity’s all-male spin-off to precursor Courage on the Catwalk. And while he did not feel he could commit to it because of his work pattern, he has taken the leap and signed up this year. He said: “I’ve met all the guys who are going through or have gone through their treatment. 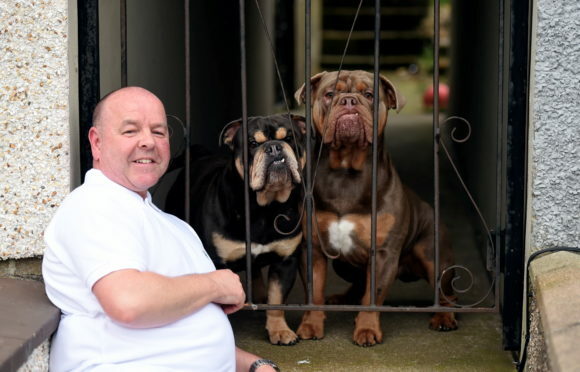 Mr Clark lives in Torry with his step-son Ryan and bulldog companions Butch and Bruno. And while he says looking after his four-legged friends is therapeutic, Brave has “opened his eyes” to having a new lease on life. “Losing Ruth and then my mother was really hard but this is really helping me,” he said. “I’m with 23 other guys and I’ve never done anything like this in my life.